On Monday, the US and British intelligence agencies released a joint report charging Moscow with unspecified “cyber warfare” against the West. The American media was filled with hysterical warnings that Russia may have hacked “millions” of personal devices as well as critical infrastructure. Two million Palestinian refugees have been trapped in Gaza for over a decade. Gaza has been turned into an inhumane open-air concentration camp. The people in Gaza have been cut off from the outside world. They are living under a blockade and Israel controls everything and anything that goes in or out of the Gaza Strip. What goes in is barely enough food for Gazans to survive. Netanyahu jokes that he has put Gaza on a diet. Meeting on Wednesday, Cuba’s National Assembly reportedly is poised to choose Miguel Mario Diaz-Canel Bermudez as Castro’s successor – an official announcement not expected until Thursday. Diaz-Canel was the only name proposed to assume the nation’s top post as State Council chairman (president of the state). Mounting evidence shows that both the Skripal and Syrian incidents were actually false-flag provocations, likely carried out by or with the connivance of Western intelligence services. The target of both provocations was, without question, the Russian state and its president Vladimir Putin. Of course Syria has also long been on the “hit list” of Middle Eastern nations targeted for “regime change” by the U.S. neocons after 9/11, with Israel a key beneficiary. We all know what transpired afterwards, as the country that we true patriots love, along with our British stooges, had committed a most heinous action, worse than even the Vietnam debacle. 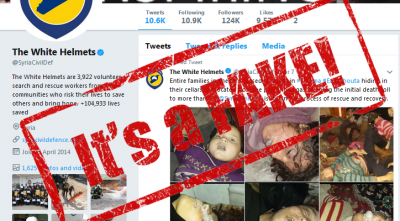 The ‘Fake News’ empire was working on steroids… and it still is with our illegal and immoral dabbling in other Middle Eastern affairs. Isn’t it time for the majority of our fellow citizens to stop believing in the lies and disinformation that passes as truthful news?